In this guide you will learn how to enable or disable Hibernate in Windows from Command Prompt and Control Panel. Also, If the hibernate option is not available in the Start menu after enabling it through command prompt, learn how to bring back then missing hibernate option in the Power menu. Click the Start button and then start typing cmd. In the search results right-click on the Command Prompt and select Run as administrator option. User account control might ask you to allow this app to make change, just click Yes and let it run. When the Command Prompt windows is open make sure you see the word Administrator in the title of that windows. That means command prompt is running with administrator privileges. Now, type the command powercfg -h on and hit Enter to execute it. If Command Prompt returns no error then you have successfully turned on the Windows 10 Hibernation. A new system file will be created on the C: drive with the name hiberfil.sys. TIP: Do you know the hiberfil.sys file is used to save all the current state of open apps when you hibernate the windows and when you turn the PC on again it is responsible to show everything just like where you have left. This file take lots of space on your hard drive, on my PC the size of the file is 5.5GB approx. In case, anytime you need some space on C drive then turn off the Hibernate and doing that will delete the hiberfil.sys from the drive and will save storage. If the Hibernate option is still missing in Power button under Start menu then you need show it form the Control Panel. Press Windows+R keyboard shortcut to open Run window. Type Control Panel and hit Enter to open up Windows Control Panel. In the Search box on Control Panel window type Power and then click “Change what the power button do” search result. This will open up the power system settings. 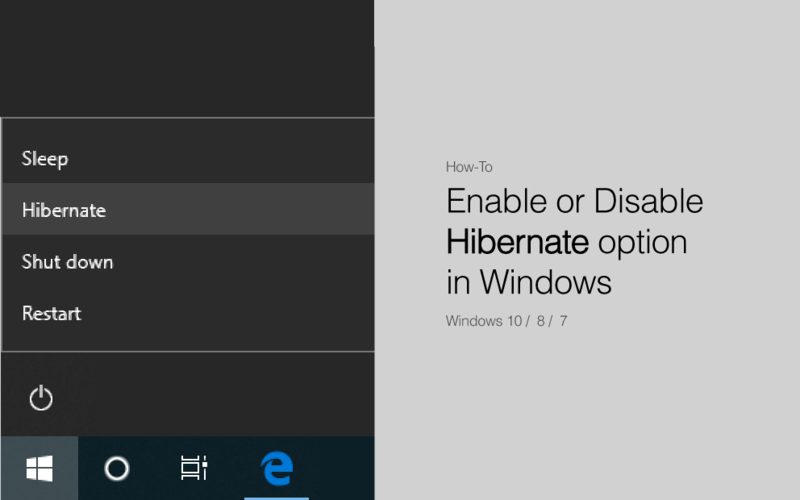 Here, at the bottom you will notice the Hibernate option is unavailable to modify. So, click “Change settings that are currently unavailable” and you will notice you can modify it now. Just check the Hibernate show in power menu option and click OK to save the settings. Now, click the Start button and then Power icon and see the Hibernate option is available. Just follow the Hibernate turning on method given above and only replace the word “on” in the command with “off” the complete command will be powercfg -h off. If you are getting any error in the command prompt please ask us using the comment form below. Method of showing Hibernate option in the start menu in Windows 7 is little bit different from Windows 10. Anyhow command prompt command is same. Press Windows Key + R and type cmd in the Run window. Type the command given below in the command prompt and hit the enter key. Click Start button and See in the Shutdown menu the Hibernate option is available or not, If Hibernate option is not available you need to do few more steps. 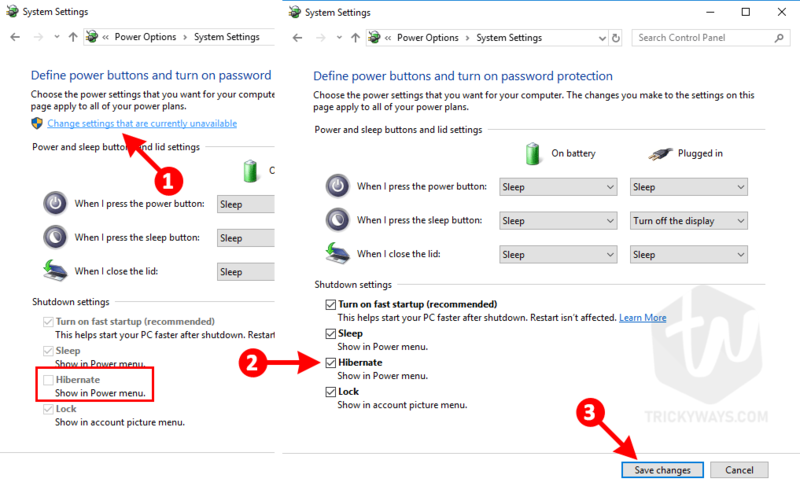 In the next Window expand the Sleep menu and select Off from Allow hybrid sleep setting as shown in the screenshot below. When you disable hibernation then file hiberfil.sys on C:\ drive will also be removed.